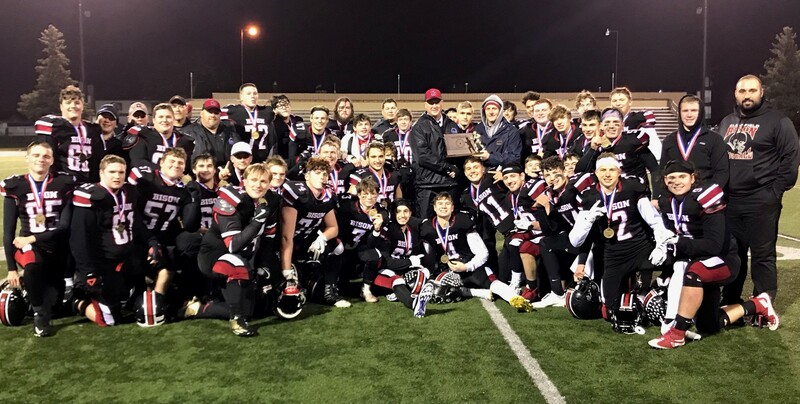 DUBOIS, Pa. – Behind Brett Zattoni, Calen Freeland and Isaac Rumery, Clearfield won the District 6-9 Class 4A title with a 49-21 win over defending champion Bellefonte Friday night at E.J. Mansell Stadium. Zattoni ran for 137 yards and two touchdowns, Freeland added three rushing scored and ran for 107 yards and Rumery added seven carries for 50 yards and two touchdowns in the victory. Clearfield jumped out to a quick 21-0 lead on Zattoni’s two touchdown runs. The first came after the Bison defense held Bellefonte to a three and out on their first series and forcing a punt that put Clearfield in good field position at their 43. On the drive Rumery found Taye Lynch for a 22-yard pickup, then a few plays later Zattoni went around the left end for a 19-yard touchdown carrying two Bellefonte defenders into the end zone. The second Zattoni score came as the result of a failed fake punt setting up the Bison at the Raiders 35. A 16-yard toss the Jake Lezzer put them on the 20, and a few plays later Zattoni went in from eight yards out. “Any time you can get good field position, it’s an advantage,” Janocko said. That good field position continued for Clearfield when Rumery recovered a fumble at the Bellefonte 32 setting up Freeman’s first score of the night on a 6-yard run that made it 21-0 with 2:34 left in the first quarter. Bellefonte battled back, driving 85 yards on the legs of Kyle Myers. The senior quarterback ran the ball eight times for 54 yards then found Noah Badger over the middle making the score 21-7. But it was to be Clearfield’s night, as the Bison moved the ball at will. On the next possession, Rumery connected with Lynch again for a 26 yard gain then called his own number going in from 11 yards out. The kick failed to leave the score 27-7. The Raiders never gave up, and once again Myers led them to the end zone to make it a 35-14 game. The Bison put the game out of reach, however, again gaining good field position at their 44 after recovering an onside kick attempt by Bellefonte. Rumery launched one deep into the hands of Lezzer for a 42-yard play to the 5 then called his number once again for a 1-yard score, putting the score at 42-14 after the 2-point play conversion. Lezzer had four catches for 82 yards on the night. Freeman scored once more for Clearfield, and Mason Grey capped the scoring for Bellefonte. The unbeaten Bison (12-0) will take on perennial power Erie Cathedral Prep in the opening round of the PIAA Class 4A playoffs. Prep beat University Prep, 52-8, Friday. That game will be either Friday, Nov. 16, or Saturday, Nov. 17, at a site and time to be determined.